Company D. Western Therapeutics Institute Inc.
Ripasudil hydrochloride hydrate (Glanatec® ophthalmic solution 0.4 %; hereafter referred to as ripasudil) is a small-molecule, Rho-associated kinase inhibitor developed by Kowa Company, Ltd. for the treatment of glaucoma and ocular hypertension. This compound, which was originally discovered by D. Western Therapeutics Institute, Inc., reduces intraocular pressure (IOP) by directly acting on the trabecular meshwork, thereby increasing conventional outflow through the Schlemm’s canal. As a result of this mechanism of action, ripasudil may offer additive effects in the treatment of glaucoma and ocular hypertension when used in combination with agents such as prostaglandin analogues (which increase uveoscleral outflow) and β blockers (which reduce aqueous production). The eye drop product has been approved in Japan for the twice-daily treatment of glaucoma and ocular hypertension, when other therapeutic agents are not effective or cannot be administered. Phase II study is underway for the treatment of diabetic retinopathy. K-115 is a Rho-kinase inhibitor as ophthalmic solution originally developed by Kowa and D Western Therapeutics Institute (DWTI). The product candidate was approved and launched in Japan for the treatment of glaucoma and ocular hypertension in 2014. In 2002, the compound was licensed to Kowa Pharmaceutical by D Western Therapeutics Institute (DWTI) in Japan for the treatment of glaucoma. The compound is currently in phase II clinical trials at the company for the treatment of age-related macular degeneration and diabetic retinopathy. Use of (S)-(-)-1-(4- fluoro-5-isoquinoline-sulfonyl)-2-methyl-1,4-homopiperazine (ripasudil hydrochloride, first disclosed in WO9920620), in the form of eye drops, for the treatment of retinal diseases, particularly diabetic retinopathy or age-related macular degeneration. Follows on from WO2012105674 by claiming a combination of the same compound. Kowa, under license from D Western Therapeutics Institute, has developed the Rho kinase inhibitor ripasudil hydrochloride hydrate (presumed to be Glanatek) as an eye drop formulation for the treatment of glaucoma and ocular hypertension which was approved in Japan in September 2014.. The company is also developing the agent for the treatment of diabetic retinopathy, for which it is in phase II trial as of October 2014.
practical synthesis of (S)-tert-butyl 3-methyl-1,4-di­azepane-1-carboxylate has been established for supplying this key intermediate of Rho–kinase inhibitor K-115 in a multikilogram production. The chiral 1,4-diazepane was constructed by intramolecular Fukuyama–Mitsunobu cyclization of a N-nosyl diamino alcohol starting from the commercially available (S)- or (R)-2-aminopropan-1-ol. In the same manner, an enantiomeric pair of a structural isomer were prepared for demonstration of the synthetic utility. The including prevention and treatment cerebral infarction, cerebral hemorrhage, subarachnoid hemorrhage, cerebrovascular disorders such as cerebral edema, the present invention relates to a salt thereof or isoquinoline derivatives useful as therapeutic agents, particularly glaucoma. It is a compound represented by the particular it is a crystalline water-soluble, not hygroscopic, because it is excellent in chemical stability, it is useful as a medicament has been known for its hydrochloride dihydrate ( refer to Patent Documents 1 and 2). -5 Isoquinoline of these – the sulfonamide compounds, that prophylactic and therapeutic agents for cerebral infarction, cerebral hemorrhage, subarachnoid hemorrhage, cerebrovascular disorders such as cerebral edema, is useful as a therapeutic agent for preventing and glaucoma in particular is known (1-5 see Patent Document 1). Conventionally, for example, a method of manufacturing by the method described in Patent Document 1, as shown in the following production process has been reported preparation of said compound (Production Method 1-A). That is, (S)-1-tert-butoxycarbonyl – 3 – by reacting the presence of triethylamine in methylene chloride-fluoro-isoquinoline (2) – methyl -1,4 – diazepane and 5 (3) – chloro-sulfonyl -4 by adding trifluoroacetic acid in methylene chloride compound (the first step), obtained following (4) to synthesize a compound (4) by deprotection to (second step) the desired compound (1) This is a method of manufacturing. It is also an important intermediate for preparing the compound (1) (S)-1-tert-butoxycarbonyl – 3 – methyl-1 ,4 – diazepane to (3), for example, in the following manner (; see JP Production Process 1-B) that can be produced is known. Further, on the other hand, the compound (1) (see Patent Document 1) to be manufactured manufacturing routes such as: Any (Process 2) are known. However, it is possible to produce in the laboratory of a small amount scale, but you place the point of view for mass industrial production, environmentally harmful halogenated hydrocarbon solvent in the compound of the above-mentioned process for producing 1-A is ( problem because it is carried out coupling step (3) and 2), giving significant adverse environmental exists. Therefore, solvent of halogenated hydrocarbon other than those listed to the specification of the patent document 1, for example, I tried actually dioxane, tetrahydrofuran and the like, but the present coupling reaction will be some progress indeed, Problems reaction is not completed raw material remained even after prolonged reaction time, yield undesirably stays in at most 30% was found. Furthermore, it is hard to decompose in the environment, elimination is also difficult to dioxane is not preferred irritating to humans, and are known as compounds that potentially harmful brain, kidney and liver . When we actually produced compound (3) by the above production method 1-B, can be obtained desired compound in good yield merged with reproducibility is difficult has further been found that. That is, in the production path, 1,4 – and is used sodium hydride with dimethyl sulfoxide in forming a diazepane ring, except that I actually doing this step, Tsu than the reproducibility of the desired compound It could not be obtained in high yield Te. Also, that this is due to the synthetic route through the unstable intermediate, that it would be converted into another compound easily found this way. limitations and potential problems of the present production process is exposed since this stability may affect the reproducibility of the reaction. Meanwhile, an attempt to carry out mass production is actually in the Process 2, it encounters various problems. For example, it is stored as an impurity whenever I repeat step, by-products formed in each stage by tandem production process ranging from step 8 gave more complex impurity profile. Depending, it is necessary to repeat a complicated recrystallization purity obtained as a medicine until the purification, the yield in the laboratory be a good overall yield is significantly reduced in the mass production of actual example be away, it does not have industrial utility of true was found. It can be summarized as follows: Considering from the viewpoint of GMP process control required for pharmaceutical production these problems. Requires control process and numerous complex ranging 1) to 8 step, 3 2) third step – amino-1 – in the step of reacting a propanol, a difficult to remove positional isomers are mixed, 3) The fourth step water is mixed by the minute liquid extraction operation at the time of return to the free base from oxalate require crystallization purification by oxalate in the removal of contaminants of positional isomers, in 4) fifth step, 5) sixth step The Mitsunobu by reproducibility poor require water control in the Mitsunobu reaction used in the ring closure compounds to (1) compounds in (6), 6) ring closure reaction, departing management of the reagent added or the like is generated, in 7) Seventh Step it takes a complicated purification in impurity removal after the reaction, resulting in a decrease in isolated yield. These are issues that must be solved in order to provide a stable supply of raw material for pharmaceuticals high chemical purity is required. Thus, gentle salt thereof, or the environment isoquinoline derivative comprising a compound represented by the formula (1), the present invention provides a novel production method having good reproducibility and high purity easily and in high yield I intended. Is a urea-based solvents nitrile solvents, amide solvents, sulfoxide or solvents, the solvent may be preferably used in the coupling step of the compound (III) and (II) are generally very short time With these solvents It has been found that can be converted to the desired product quantitatively. It is possible to carry out the coupling step Volume scale while maintaining a high yield by using these solvents, there is no need to use a halogenated hydrocarbon solvent to give significant adverse environment. In consideration of the process such as removal of the solvent after the reaction was further found that acetonitrile is the best among these solvents. Also, since by using hydrochloric acid with ethyl acetate solvent in step deprotection can be isolated as crystal of hydrochloride desired compound (I), without going through the manipulation of solvent evaporation complicated , it has been found that it is possible to obtain the object compound (I) is a simpler operating procedure. Since there is no need to use a halogenated hydrocarbon solvent in this deprotection step further, there is no possibility of harming the environment. It has been found that it is possible in mass production of (II), leading to the target compound purity, in high yield with good reproducibility as compared with the conventional method compounds are important intermediates in the coupling step further. That is, was it possible to lead to the intermediate high purity and in high yield by eliminating the production of a harmful halogenated hydrocarbon solvent to the environment in this manner. 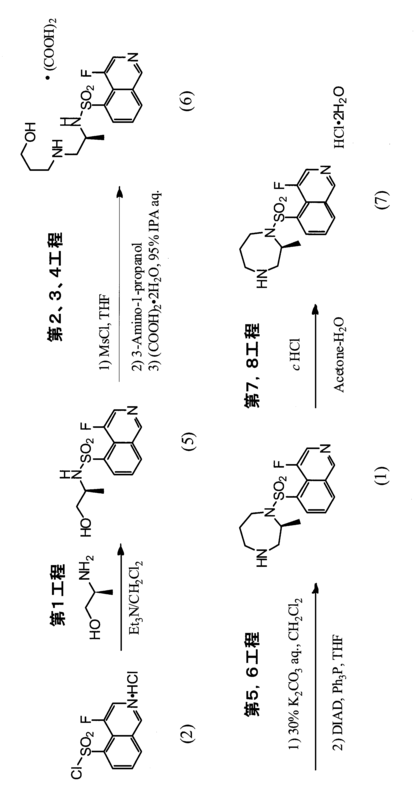 1,4 addition – in order to avoid the problems encountered in the reaction using sodium hydride in dimethyl sulfoxide in forming the diazepane ring, in order to allow the cyclization reaction at mild conditions more, as a protecting group By performing the Mitsunobu reaction using Noshiru group instead of the carbobenzyloxy group, in addition to one step shorten the manufacturing process of the whole, without deteriorating the optical purity was successfully obtained the desired compound desired. By DR ANTHONY MELVIN CRASTO Ph.D in Japan marketing, Uncategorized on December 8, 2014 .